22 Jul Sigh. Still So Far to Go. Instead of working on my thesis that’s due in 3 weeks (ugh, don’t even tell me- I know…) I decided to spend my night on Twitter trolling around to see what was being said about the ostomy. Ladies, next time u’re out and u wanna get rid of a guy, just show him your Ostomy. It’s times like these that I feel as if all of our efforts have gone to waste. Does this guy not know I am currently in a loving relationship with a guy with whom I live with who sees my ostomy every day? Ok, well, no he doesn’t.But he should know that having an ostomy does not change who you are. In fact, having an ostomy only changes how you go to the bathroom- something most girls tend to keep secret anyway! It’s not like if I didn’t have an ostomy I’d just be going to the bathroom with the door wide open for a guy to see. No! It’s hidden behind a bathroom door just like everyone else! Hello! Feminine air of mystery. Now, I don’t want to belittle all of our accomplishments so far, because as you all know by now, we have hit over 4,000 likes on the Facebook page, which is really freakin’ awesome! However, the tweet by this clearly misguided individual is evidence that we have much more to do. Do you know why I was so excited? 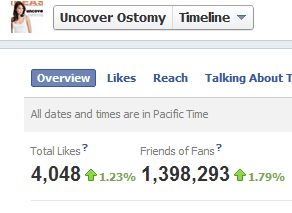 This piece of data shows that the total number of friends of all 4,048 people who like the FB page is 1,398,293 people. This means that if we were able to get all of our friends to join the Facebook page, we would have 1,402,341 likes! …Ok, ok, I’m not crazy or anything and I am fully aware that there is no chance of getting all of everyone’s friends to like the UO page. Heck, not even all of mine like it! (…jerks). What this means, though, is if every one of you, who likes the UO page, invites their entire friends list and even 1% of those people like the page, that’s a huge increase in likes and, therefore, a huge increase in awareness! So once again, I am making a plea to you to share Uncover Ostomy with your networks! 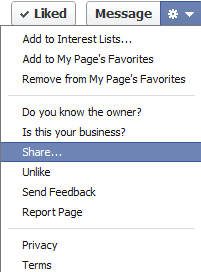 Now, why I am asking you at this very moment to get all of your friends to the FB page? Well, for those who have noticed over the past few days, I have posted some photo updates to the page that gives hints to the AWESOME things that UO has coming up. I have not, and will not tell you exactly what’s to come, but over the next few weeks/few months (before World Ostomy Day), you’ll be getting some more hints and sneak peaks at what we are going to be launching. In order for it to be as awesome as I anticipate, however, we need some more likes so the message can reach more people. I would really appreciate it if you could take the time to share Uncover Ostomy on your timeline to your networks so that we can work to extend our UO community. Sharing the link on Twitter and other social media sites like Pinterest and LinkedIn are also appreciated! It is obvious from the tweet posted above that we still have much to do in order to spread positive ostomy awareness to the public. I also know that what we have in the works for UO is going to help us spread this message even further. However, the only way this initiative can be truly successful is if I have your help. Then she didn’t contact me again for months, and then only to suggest that I try an online dating service. Having said that, most people in my circle (virtually everyone else, as a matter of fact) have been HUGELY supportive and helpful when I need it. I’m still gunshy about anyone seeing mine (short of medical professionals, only one person has seen it, to my knowledge- Lord only knows who’s peeked when I was asleep or unconscious in the hospital), but that’s more of a personal issue than anything else. It was a guy’s comment… I’ll have to edit that in. Glad you have a support system! Oh, it’s not just the Ostomy itself…I have a midline incision scar that runs from my sternum to my pubic bone. Which can be a little daunting…also, I have a clear pouch which makes a little bit of a difference- an opaque flesh colored one isn’t too bad to show off….on which is actively full of poo/poo remnants? Is a bit tougher to show off. Having said THAT…the one person who has seen it is a beautiful, intelligent, awesome woman about whom I care deeply (and who feels the same, i think)…so that helps a LOT. Ah yeah, I read all of the Ostomy twitter-talk almost daily through a feed I created in Google Reader and see this kind of stuff from time to time. Many people I talk with do not know what an Ostomy or a stoma is (or they do, they just don’t know what it’s called, or why people have the surgery.) Like most things in life, ignorance usually exists until someone or someone they know have had their lives touched with it on a personal level. That perspective and familiarity changes everything. What you’re doing is encouraging for so many people, keep up the good work! I honestly would not take this too seriously. There are all sorts of trolls spewing the most vile type of hatred (racist, misogynist, etc) on all sorts of social media and other sites. They are cowards and have all sorts of rage, mental health and self esteem issues. It’s not worth addressing this type of garbage IMHO. The best response is to keep doing what you’re doing, which is living a happy, healthy life surrounded by people you love. This person likely does not have that otherwise they’d have better things to do. Good luck with your thesis. I wrote mine while working full time in very stressful circumstances too and I have no doubt you’ll do great. I occasionally type the word ‘colostomy’ into Twitter and find the amount of vitriolic tweets quite staggering.